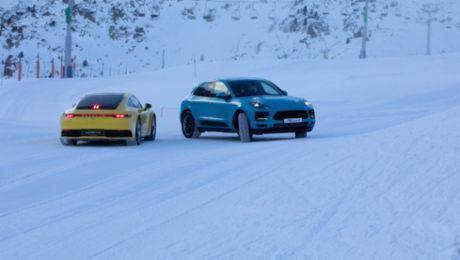 Like every Porsche, the Macan epitomizes the optimal interaction of man and machine. The intelligently controlled production process involves multiple locations and many suppliers, and culminates in state-of-the-art production at the Leipzig plant. In our series "Made perfect – the journey of the Macan" we accompany the entire production process of the compact SUV. The first part takes a look behind the scenes of the new body construction area. The floor group opens the dance. At station 1810 in the new body construction area of Porsche’s Leipzig plant, three yellow robots perform their perfect choreography. They weld the front and rear floors as well as the front wheel wells, including the spring strut mounts and longitudinal members, with flowing, almost human movements. The Macan is built from the bottom up. At station 1810 the Macan is baptized—from here on out it’s a vehicle—and receives its birth certificate in the form of a transponder that bears its vehicle-specific identification code. Meanwhile, the first of the three robots has put down its welding gun and taken up the handling grippers with which it lifts the Macan underbody and places it on a transport slide, on which it then proceeds through body construction (see the info graphic starting on page 80). This step is followed by assembly of the side sections and roof as well as add-on part assembly, where the doors, tailgate, front wings, and clamshell hood, previously assembled in parallel steps, are integrated in the body. The hood is both a visual and a manufacturing highlight in one operation. “Its shape and size presented massive challenges at every stage of the production process,” says Thomas Riediger, the man in charge of planning the new lines. The process begins in the Volkswagen plant in Bratislava, Slovakia. There, on the biggest press in the Volkswagen group, the Macan hood is formed. The press works with a force of 91,000 kilonewtons—roughly equivalent to the weight of 4,500 Macans—creating an especially large draw depth (the term when a cup or boxlike structure is formed) of 380 millimeters. The de-stacking, or transferring of the pressed parts, is done fully automatically by robots. This technique, which to date is done only in Bratislava, ensures that the aluminum hood is not damaged. Back in Leipzig, we are at the last station in body construction, the finish. Two body construction technicians check the surfaces and add-on parts. “The vehicle geometry has to be right for everything to fit perfectly in assembly,” explains Riediger. From here, the bodies are sent to the paint shop. In the next part the Porsche Newsroom accompanies the Macan at the paint shop. Management in production – a male domain? Jana Igel proves the opposite.